Part of the Yeshiva’s credo involves individual attention to every Hesdernik. This applies not only while they are learning at the Yeshiva but also when they leave temporarily to perform their military duties in the IDF. In light of this, a volunteer from the higher Yeshiva classes is appointed to be responsible for maintaining personal and ongoing contact with each and every one of the Kiryat Shemona Hesder soldiers for morale-boosting purposes. Activities include organizing visits from other Hesderniks and Rabbanim, sending packages, and providing solutions for problems that may arise in the field, such as matters pertaining to Halacha. 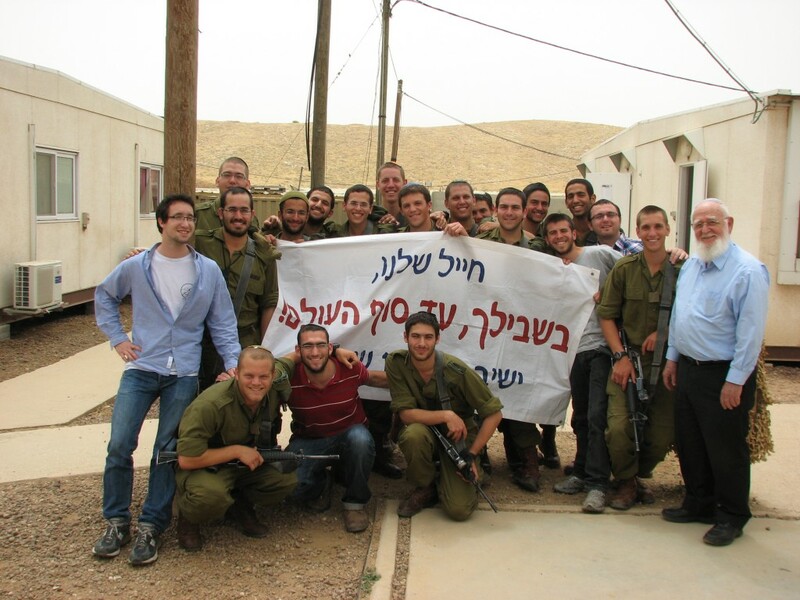 Rabbi Drori recently made these Hesder soldiers very happy when he paid them a surprise visit on their base in the “Kfir” infantry unit . The role of this particular unit is to guard and protect the villages and homes of residents who live in Judea and Samaria. The banner in the picture reads “Our soldier: For you – to the end of the world! Yeshivat Kiryat Shemona”.